1. How can I identify my existing ceiling tiles? To determine which tile you have try taking one down and looking for a code on the back. Tiles made by Armstrong have a unique reference code starting with BP which will confirm the tile you have. 2. What sizes of suspended ceiling tiles are available? We offer standard sizes 1200x600mm and 600x600mm. These references are the industry standard terms but the tile dimensions actually measure 5mm less in reality. 3. What sizes of suspended ceiling grid are available? Ceiling grid is measured by the width of the surface that is visible from the room. Standard suspended ceiling grid is 24mm wide. A narrow grid called Microlook is 15mm wide. 4. What edge details are available for suspended ceiling tiles? Square edge tiles fit 24mm wide grid and the face of the tile sits flush within the grid to create a smooth ceiling surface. Also known as board edge. Tegular edge tiles fit 24mm wide grid and the face of the tile drops down below the grid into the room. Microlook tiles also have a tegular edge where the tile face drops down below the grid but these are compatible with the 15mm Microlook grid only. 5. What are suspended ceiling tiles made from? Generally ceiling tiles are made from a mineral fiber of wool and clay. Metal tiles are also available. 6. Which suspended ceiling tiles have the best acoustic rating? The sound attenuation dB score measures the acoustic performance of a ceiling tile. Armstrong Perla, Ultima+ & Bioguard Acoustic are thicker tiles that are designed for excellent sound proofing. 7. 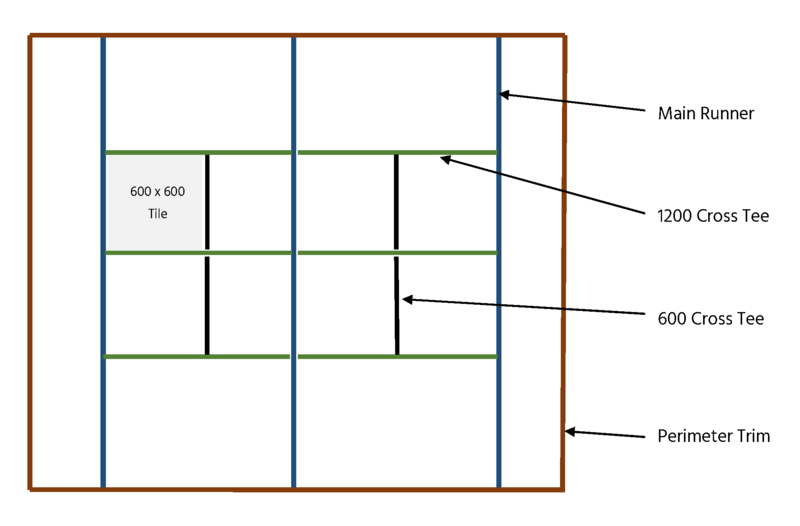 How is suspended ceiling grid constructed? Firstly perimeter trim is installed around the edge of the ceiling. Main runner is then fitted across the length of the room and fixed to the roof above using brackets and wire. 1200mm cross tees will then be installed between the main runner lengths. If you have 600x600mm tiles then you will also need 600mm cross tees to be fitted in between the 1200mm cross tees. Finally the tiles will be installed. If tegular or microlook tiles are being installed then teg blocks will be required to prop the tile edges up on the perimeter trim.